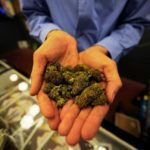 The Friday File: During the first five days retail marijuana stores (there are just two) were open in Massachusetts, from 11/20 through 11/24, customers bought $2.2 million of pot and pot products! The average amount spent per item, such as 1/8 of an ounce of cannabis flower, was $39.33. A special 17% state cannabis tax and 3% local cannabis tax means Massachusetts revenues are $376,995 higher; city revenues $66,528 higher.